When it comes to running a car, we in the UK have to foot the highest costs in the world. As the infographic below shows, whilst a driver in the US pays an average £2,425 a year to keep their car going, Brits are getting hit with expenses of more than £1,000 extra. An accident will only add to these costs, but Motor Legal Expenses Insurance will help you recover any uninsured losses you may suffer. So whether it’s recovery of your vehicle at the scene, hiring a car whilst yours is off the road or compensation for any personal injury you may experience, our Motor Legal Protection will have you covered in the event of a non-fault accident. 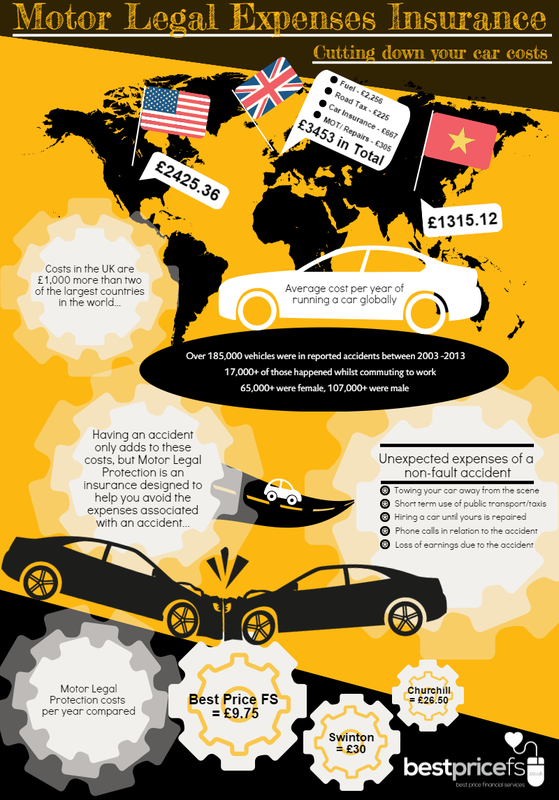 Check out the infographic below for some great facts on car costs in the UK and see just how much you can save with Motor Legal Expenses Insurance from Best Price FS.